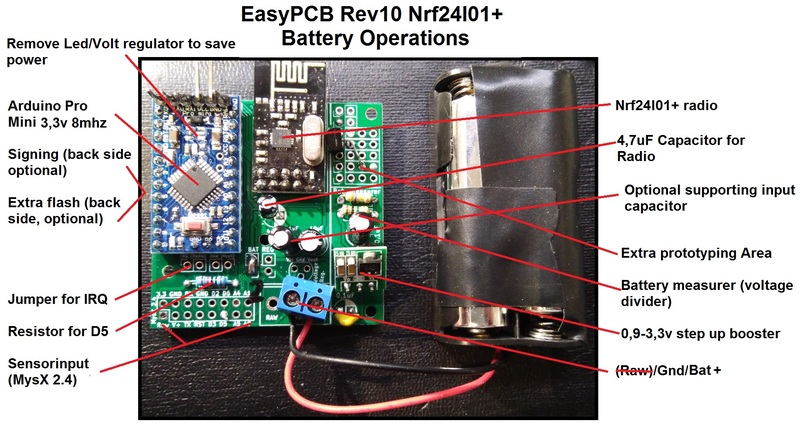 This is the Nrf24l01+ edition of EasyPCB! If you want to use RFM69 transceiver instead go here. So pretty much this PCB covers all the basic stuff documented in the MySensors website! This cuts my work with one node from a couple of hours (soldering wires) to 20min. The design is the design from by my forum post here but also much cred to @m26872 My 2Aa battery sensor design. BAT jumper should be soldered. Remove Pro Mini voltage regulator and led/resistor. Please, note that different radio clones behave differently depending on noise from the booster. A good quality booster is important or you might have to modify and test different input caps on the radio and/or try to filter the booster with a different capacitor. A normal behaviour can be that you have to change the 4.7uF capacitor to a 47uF capacitor on the radio for example. I'm going to do more testing in this area to provide some more advice soon. REG jumper should be soldered. Input 6-12V to RAW (right pin - not VCC!) and the voltage regulator onboard the Arduino Pro Mini will regulate it down to 5v. You also need the 5 to 3.3v voltage regulator with capacitors to power the radio. Nu jumper needs to be shorted. Be careful using 12v to RAW on the cheap Arduino clones! Due to bad/cheap voltage regulators on the clones, many fail pretty fast. If you want to use 12v I would recommend using a genuine pro mini or regulate the voltage yourself and not let the clone do it. To be able to achieve this you need to reprogram the atmega bootloader/fuses and lower the BOD! Both REG and BAT jumper should be soldered. With both REG and BAT closed you will feed everything (Arduino, Radio and Sensors) with whatever voltage the battery holds. You can not use any sensors which require higher voltage than the current battery status (without DC/DC Step up booster). With this configuration, you can use the internal VCC library to read battery status on VCC. Lowest working voltage (depending on added sensors) will probably be the radio which can handle down to 1.9v. Do not use any DC/DC step-up booster or voltage regulator! To lower BOD you can use standard Pro Mini bootloader and change boards.txt. See here for instructions.. This will give you some more battery (down to 2.2-2.4v? due to 8mhz) but use the 8mhz external crystal will be risky at low voltages (at least at 1.9v, radio minimum) so it might be a good idea to run a bootloader @ 1mhz internal oscillator. 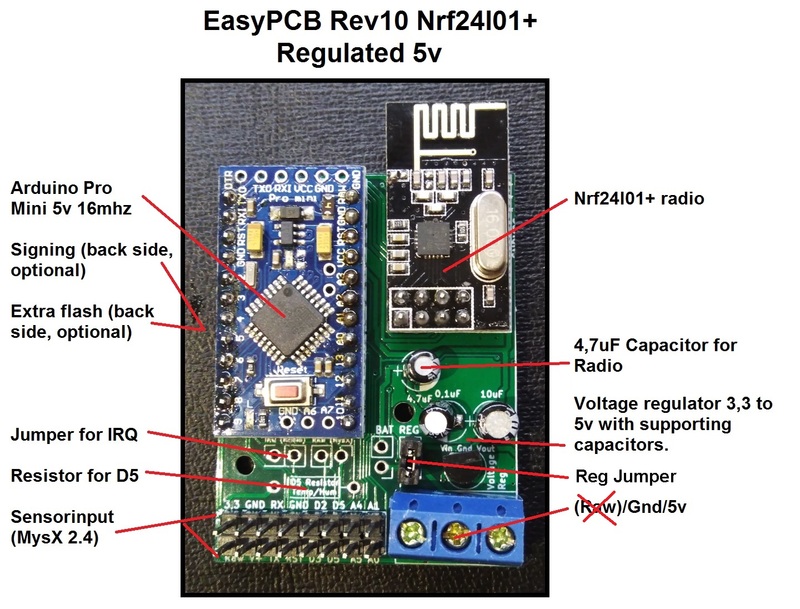 A great video by @wez on how to assemble the EasyPCB (RFM radio, but otherwise the same!) with Booster and Battery (timelapse). A good example on how to build modular which allows to remove or change hardware if something goes wrong/stops working or you just want to re-use the sensor in the future for something else. A build video of a regulated 5v EasyPCB (nrf24l01+), including uploading a sketch for testing the radio and clearing the EEPROM. 5x3cm for cut PCB/regulated voltage and 5x5cm battery operations with extra prototyping space. REG: Use this if you are using 5v regulated DC. It will power the radio from the voltage converter. RAW: This is a MysX feauture. This cuts onboard Vraw source if daughterboard provides Vraw. This is only used when EasyPCB is connected to a daughterboard. IRQ (Radio): Pin 2 on the Arduino is disabled so you can use this for interrupts instead of the radio. Most of the time this pin isn't used by the radio, so therefore disabled. If you want to enable this pin you can connect this jumper. This is The MySensors expansion connector to which you can connect any daughterboard using this standard. This is also your main input/outputs for sensors and actuators so any wires can be connected accordingly. With this PCB as motherboard, you can use draughtboards if you need multiple copies and needs a quicker way to build - just like a shield on Arduino or Raspberry Pi. Also a great box by barbuino here. MysX location changed to accept more MysX boards and align like RFM version. Relocated D5 pullup, MysX and IRQ jumper some. Changed footprint (silk-screen) on the capacitor to easier show Gnd/Pos side. Download from this page to get Eagles and Gerber files. Note that the Gerber files are run with Itead cam job. If you want a faster shipping time or fewer pieces you can buy them from me via Ebay. All feedback welcome! The main goal is to keep it as simple as possible though. Q: What is the battery life on 3.3V and booster? A: Depending on what sensor you wish to run and how frequent you want to get data! One example: DHT22, sleeping 15min and sending Temp/Hum with a china/ebay booster is about a year. You need to desolder the led and voltage regulator on the Pro Mini 3.3v and use sleep() mode to save power. Q: Why is the radio sticking outside the PCB? A: Having metal close to the radio antenna will likely mess up the reception. Q: What is the IRQ jumper for? A: IRQ (or D2 on the pro mini) can handle interrupts and isnt used in all transceiver operations (not always needed). So this way you can choose to use IRQ either as interrupt or for the radio. Q: Will it work with all Arduino Pro Mini? A: No - only with the same footprint (most common) used on the PCB! Look here. Q: What is the purpose of the Raw connection under the radio connection? A: Its a criteria of the MysX connector - to be able to switch RAW on/off from a daughter pcb. You dont have to think about it until you have a mother/daughter board. Q: How could I connect radio's power input to boosted powering source to get stable 3.3v? A: use regulated power instructions instead. Set the jumper on "reg" and bypass the voltage converter with a wire. Whats good to know is that this has been tested over and over in this forum and the conclusion has been so far that if you run with 2xAA the best solution is to bypass the radio in the booster (i.e. use battery instructions - hence the difference). The radio can handle down to 1.9v so it wont die for a long time if you have some power savings in use. The booster might also cause noise and reduce its efficiency/range. Q: Is it possible to use 5v mini + 9v battery with measurement ? A: Powering it through RAW is possible but if you want to use the booster and battery measuring this is not an option , you need to power it through PWR and BAT jumper. I think what described here is possible but untested. First you need to find/create a booster that can handle the battery. Also you need to make corrections on the voltage divider(47k and 67k?) for the battery measuring and also code changes. Please share any test with this. Q: When i use a 3,3V mini then i do not need the 3,3V regulator and it is powered with a battery. If i use a 5V mini then i need the regulator. Is this correct? A: Correct statement. The radio cant handle 5v. Q: Do i need the booster if batteries are used? A: No, you can bypass it with a jumper/wire - but it will give you alot of extra. Without the booster the arduino 3.3v will die somewhere between 2.8 and 3 volts, with booster you can go down to 1.9v. Q: How about the RAW option? How does it go to 5V? i need the regulator to go to 3,3V so how do i loose the 6-12V A: There is a voltage regulater on board the pro mini that handels from 6-12v (be cautious using 12 v, 9v is max i recommend on clones). This will convert your RAW to 5v and provide the board with this. Then the external regulator will go from 5 to radio 3.3v. 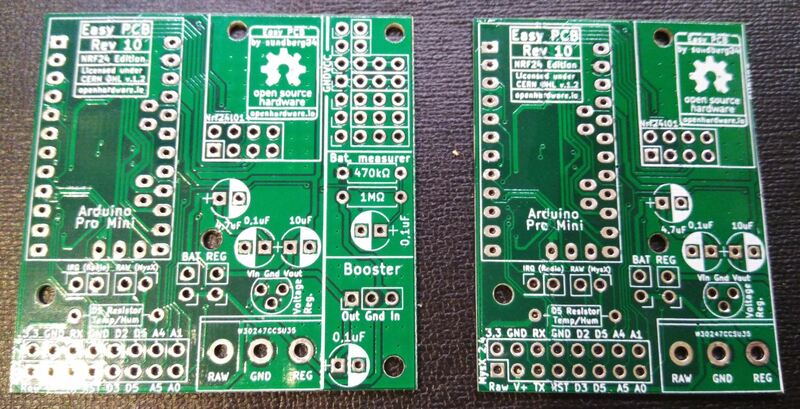 You could use a 12 to 3.3v regulator outside the PCB and use the 3.3v REG option. Q: How do I access A2, A3 and D8? A: They are not accesses through the PCB, so you need to directly solder to the pro mini. Q: What's the 0.1 uF capacitor next to the battery terminals/voltage regulator for?? A: Its to maintain stability of the voltage regulator. If you look at different datasheet most voltage regulators has a typical application schematics where different capacitors is added before and after to make this. So the 10 and 0,1uF work together. Why 0,1 and 10? Well - I have seen this setup on the forum many times so I just went with that. There is alof to read about this, but I think the smaller cap can react faster while the bigger cap have more juice to give so to say. The capacitors are NOT needed if you doesnt use a voltage regulator. Q: Can I use any other batteries than 2xAA (3v) ? A: Yes - but the voltage needs to be regulated to fit the hardware on the board. You also needs to update the voltage divider to fit your battery voltage if you want to measure battery status (and using booster). Here is a example of 5.5v project with a voltage divider reading voltage status.